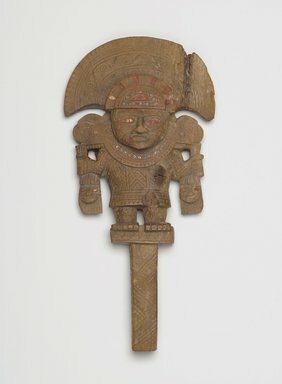 Wooden mirror handle with carvings that portray a well-dressed individual, standing on a small pedestal, holding a trophy head in each hand. The individual wears a tunic with sleeves, a crescent-shaped headdress, and a collar with a serpent head. On the figure's tunic, headdress, legs, and elsewhere are triangles in relief. On the handle, collar, and headdress are turquoise bead inlays. Around the inlays are traces of red pigment. The eyes of the central figure as well as the eyes of the trophy heads are inlaid with thin sheets of gold that are covered over with red pigment. In the back of the carving is a shallow circular cavity which probably held a pyrite mirror. Condition: The front of the proper left side of the handle is damaged; the headdress of the central figure is chipped, broken, and repaired; the tunic has two gouges; the hair of each trophy head is chipped along the edges; the end of the handle is cracked. The object reveals overall surface wear.